Create a design and simulate using EE-Sim® tools: The MAX1491/MAX1493/MAX1495 low-power, 3.5- and 4.5-digit, analog-to-digital converters (ADCs) with integrated liquid crystal display (LCD) drivers operate from a single 2.7V to 5.25V power supply. They include an internal reference, a high-accuracy on-chip oscillator, and a triplexed LCD driver. An internal charge pump generates the negative supply needed to power the integrated input buffer for single supply operation. The ADC is configurable for either a ±2V or ±200mV input range and it outputs its conversion results to an LCD. The MAX1491 is a 3.5-digit (±1999 count) device, and the MAX1493/MAX1495 are 4.5-digit (±19,999 count) devices. 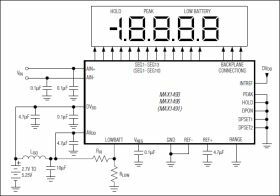 The MAX1491/MAX1493/MAX1495 do not require external-precision integrating or auto-zero capacitors, crystal oscillators, charge pumps, or other circuitry required with dual slope ADCs (commonly used in panel meter circuits). These devices also feature on-chip buffers for the differential signal and reference inputs, allowing direct interface with high-impedance signal sources. In addition, the MAX1491/MAX1493/MAX1495 use continuous internal offset calibration, and offer >100dB rejection of 50Hz and 60Hz line noise. The MAX1493/MAX1495 perform enhanced offset calibration at power-up. The MAX1495 also performs enhanced calibration on demand. Other features include data hold and peak hold, and a user programmable low-battery monitor. The MAX1493/MAX1495 come in a 32-pin 7mm x 7mm TQFP package, and the MAX1491 comes in 28-pin SSOP and 28-pin DIP packages. All devices in this family operate over the 0°C to +70°C commercial temperature range.